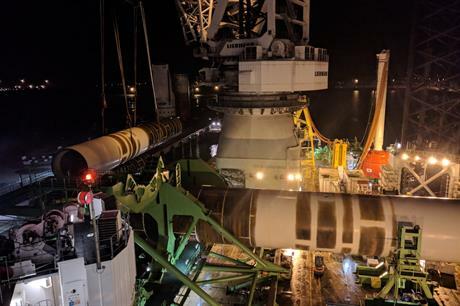 DENMARK: The first four monopiles have been installed at Vattenfall's Horns Rev 3 site in the North Sea. Construction work at the 49-turbine, 406.7MW site off the coast of Blavandshuk in the Danish Jutland peninsula began this month. Marine contractors GeoSea will install the next four monopiles 34km from Esbjerg Harbour before the end of the month, Vattenfall said. The 40-50 metre steel foundations have a diameter of 6.5 metres and are driven 30 metres into the seabed. They will support MHI Vestas’ uprated V164-8.3MW turbines. Phased installation of wind turbines is expected to start next year, according to a project timetable published by Vattenfall, with the completed project due online in 2019. Horns Rev 3 is one of four Danish offshore wind farms the Swedish developer is building. Vattenfall is also involved in the 600MW Danish Kriegers Flak, due online in 2022, and the Vesterhav Nord (North) and Syd (South), which are both due to be commissioned in 2020 and have respective capacities of 170MW and 180MW. Last August minehunters from Danish Defence used a remote-controlled, unmanned mini submarine to detonate three unexploded naval mines that had been discovered during a geophysical survey of the seabed at the project site. During construction, a support vessel has been contracted to place a sound-absorbing, double layer of air bubbles to protect marine mammals from noise.